This update has been coming for a long time and was actually pretty much complete before the summer, but I’ve been so busy with my new role at College that I haven’t had a second to package it up and get it out. 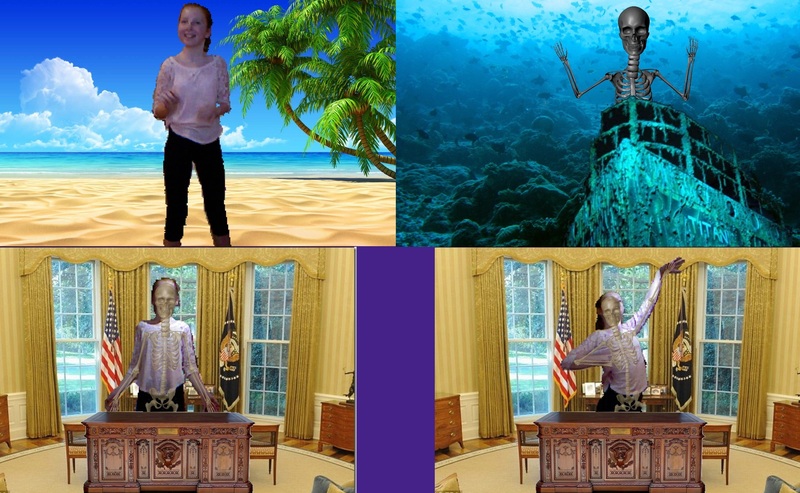 The new version of my Kinect educational games makes use of the latest Kinect SDK (v1.8) for the original Kinect for Windows, using the new SDK brings some performance boasts in itself. However the main thing that this release adds is the new X-Ray mode in my NoNeed4Green program (the green screen without a green screen). Press X once to show a skeleton overlaid on whoever is standing in front of Kinect, press it again to show just a skeleton avatar. I’m sure all you innovative educators out there can think of uses for this in the classroom. Download the new version of Kinect Games from here. It requires Windows 7 or Windows 8 and a Kinect for Windows v1 or Kinect for XBOX360 with external power supply. Thanks goes out to Benjamin Swindells (an ex-student of mine) for providing the skeleton graphics captured from his 3D models. Benjamin is one of the best 3D modellers/animators I have had to privilege to teach, far better than me at 3D art. Also thanks to my fellow MS expert educator Simon Johnson for creating transparent versions of the skeleton for the overlay mode. 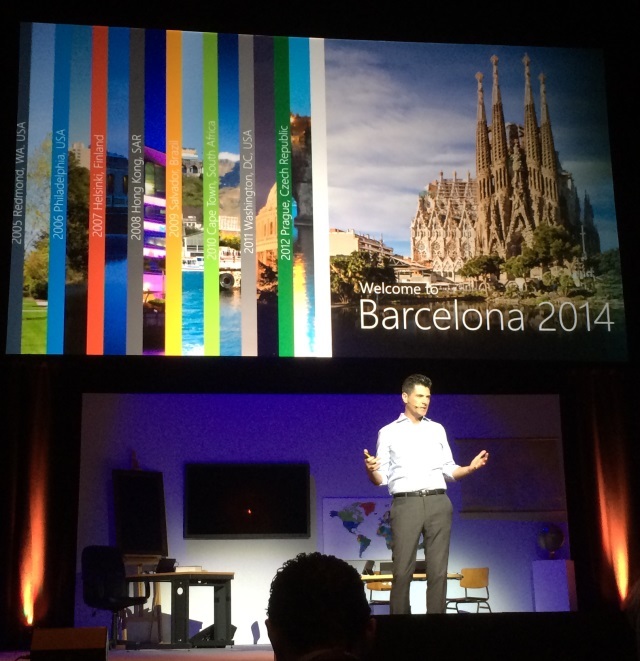 Last week I attended the Microsoft in Education Global Forum in Barcelona. I was selected as part of a ten strong team from the UK to attend the conference, although I was the only Scot in the team and the only FE lecturer. 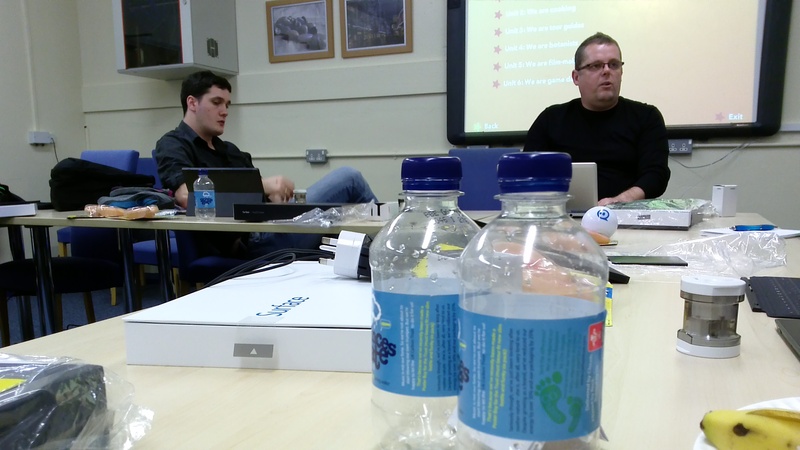 The week was an amazing mix of talks, panel discussions, collaborative sessions and a TeachMeet. We also spent 2 half days exhibiting our learning activities on stands to the other educators and school leaders at the conference. However for me the best thing about the forum was the amazing educators that I met from around the world and the future projects that I will now be able to collaborate with them on. On day one of the conference a highlight for me was Stuart Ball, UK PIL manager, presenting on some of the amazing apps for education that are available on the Windows 8 store and more specifically for the Surface tablet. I downloaded 5 or 6 apps onto my Surface during the session that I hope to make use of them in my classroom practice. The other major part of day one was the first exhibitor session, where we got to show off our projects to educators and school leaders from around the world. There were 6 of us from the UK manning stands, with a variety of projects. Simon & Ray both had projects around TouchDevelop, while the Queen of Kodu, Nicki, was presenting on the KoduKup. I was mostly talking about a project I ran, where my college students made games in groups in conjunction with a local primary school using XNA. However I was also speaking about using Kodu & TouchDevelop to teach coding to children and teachers. So there was a common theme of coding in 4 out of the 6 projects, which reflects the current trend in the UK towards programming in Computing. I found the exhibitor sessions invaluable, my only criticism is that I wish I had more opportunities to visit the other stands myself, as we were pretty much tied to our stands. I think a system where only half of us were presenting at a time, while the other half were free go around and visit the other stands would be a much better approach in future. On day two we started with an inspiration keynote address from Anthony Salcito, Microsoft’s worldwide Vice President for Microsoft Education. 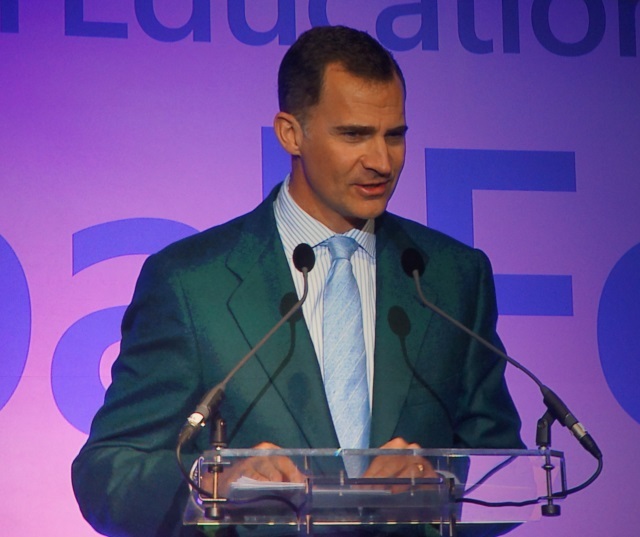 He started by saying that our students are learning without us; I wonder myself if sometimes it is despite of us . He talked about Microsoft’s commitment to education and teachers. He also made it clear that he recognises that technology isn’t the answer, but great teachers using technology well is. He also demonstrated the amazing Project Spark, which although not new to me, drew gasps of amazement from the audience. Project Spark is Kodu on steroids, it builds on the creative 3D world available in Kodu, by allowing students to create truly jaw droppingly beautiful worlds, but is also allows them to fully customise that world by programming the objects within it, to do whatever they want. Whether it is telling a rock to follow your character or making an ogre dance when you are near it, you can truly create whatever you want. He also demonstrated an amazing new app called ChronoZoom, which allows you to create dynamic timelines on any topic. A great tool for teaching History, but not just limited to history as it can be used to visualise historical or future timelines for any subject. After the keynote it was back to exhibiting our learning activities. This time I decided to take time to talk to the other expert educators, so I was a little bit naughty in that I left my stand unattended for a while and went to the other displays and spoke to most of the educators near me, which just so happened to be mostly team USA. This was my favourite thing from the conference, making connections with other educators from around the world and seeing the innovative ways that they are making use of technology in the classroom. I spoke to Michael Braun from Seattle, who I had actually met before when I visited a high school in Seattle to speak about TouchDevelop, while I was at the MVP summit in November last year. I learned about how he has been using TouchDevelop to teach coding in his classroom on smartphones and tablets. I also spoke to two teachers from Tampa (Bradley Smrstick and Joshua Sawyer) who are running Coding camps in Florida during July, which coincides with when I am there on holiday with my family, so I’ve arranged with them to do some sessions on TouchDevelop & Kodu while I am there. I also spoke to a primary teacher from Canada (Leah Obach) who is now going to enter 2 teams from her School into a Minecraft competition that I am running in conjunction with the College Development Network in Scotland. It was also great to see so many Kodu projects from educators around the world, I think I counted 7 different projects, including one from my friends from Norway, who have 70 schools involved in their KoduKup competition this year. My Norwegian friends have also invited me over to Norway in May to judge at the Norwegian KoduKup, which hopefully I can arrange to do. It inspired me to look at setting up a Scottish KoduKup, which Microsoft have given me permission to do, so watch this space for further details. 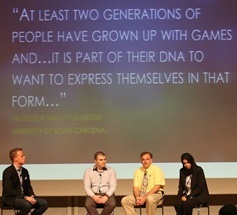 In the afternoon after I finished exhibiting, I attended a hot topic panel discussion on “Inspiring Student Learning and Creativity through Gaming”. I wasn’t actually expecting much from this, as it was not a formal talk, however it featured an Australian guy called Simon Breakspear who is an educational speaker, researcher and innovator. He communicated much of my own thinking about the proper use of games in education, in a far more articulate manner than I could have. Simon was my favourite presenter from the entire week, as games for learning is something close to my heart. I was chuffed to get a retweet from him with my thinking that the “gameplay should be where the learning happens”, as far too many “learning” games use the gameplay as a reward for answering a question. The key to a good educational game is where they learn through playing, rather than by using the gameplay as a carrot. We also need to look at how games that students already play & love, can be used in learning, a great example being MineCraft, which is so much more than just a fun game and can be used to encourage collaboration, teamwork, creativity and even programming. Simon is someone I hope to hear from again and I will try and get him to come speak at one of the conferences I am involved with in the upcoming year. In the evening I managed to get away from the conference and went down to see Barcelona beat Manchester City at the Nou Camp. Being a good Scot, I was wearing my Barcelona top and sat in with the Catalans. It was an amazing experience to see a near full Nou Camp cheering on Messi and co to victory, although I must be honest and say the atmosphere doesn’t compare to Ibrox on a Champions league night (although it might be a while before I experience that again). I also got to witness the nasty side of English footie fans, as the Manchester City fans, who were right behind me, went about wrecking the fence that was keeping them separated from the Barcelona fans. On day 3 we had the Learn-a-thon, which I wasn’t really expecting much from, however it was actually a valuable experience and put the educators on the other side of things, as we worked together with educators from around to world to create a learning activity, while overcoming obstacles such as the language barrier. Our team worked to our strengths with our art teacher Darko from Macedonia creating an impressive stop motion animation about our theme which was “Treasuring Water”, while I created a Kinect game on the same theme. That evening Stuart Ball and Dave Rogers from the UK team did a fantastic job organising a TeachMeet for Western Europe. Unknown to me, TeachMeets are a British thing, which the other countries were not familiar with, however it went very well and it was one of the best events I attended all week. I got another chance to present my xGames to educators who had never seen them and I had a lot of interest in them, especially from the Netherlands. 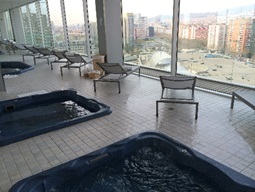 On the last day we presented our Learn-a-thon learning activity to the judges in the morning, after which myself, Ray, Simon & Dave Rogers finally got a chance to enjoy the Sauna & Jacuzzi facilities of the hotel that Microsoft had very kindly put us up in. It was nice to get a chance to relax for a couple hours and take in the wonderful views of the surrounding area. Early afternoon we went back to the main conference auditorium where we had an address from Prince Felipe, heir apparent to the Spanish throne. We had to go through proper airport style security checks to get into the conference arena, because of the presence of royalty, as evidently he isn’t too popular in Catalonia. In the evening we got dressed up for the formal Gala Dinner and awards ceremony. I spoke with James Ptaszynski at the dinner, who is Senior Director in MS for Higher Education strategy, about the role that FE & HE may play in future Global forums. 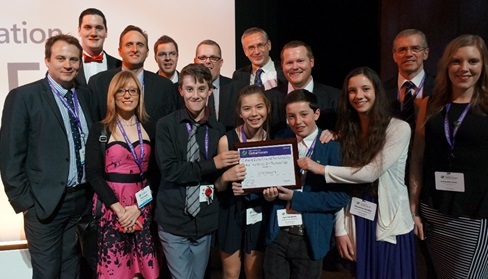 At the awards ceremony Scott Wieprecht from the UK team placed 2nd runner up in the Cutting Edge use of Technology for Learning category, so Congrats to Scott and his school Saltash. 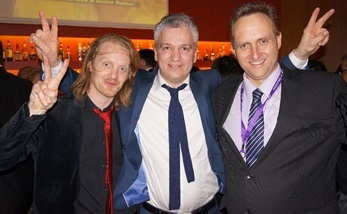 At the after party I spent hours with my Norwegian friends speaking about teaching, education, politics and the meaning of life. We agreed that I must visit Norway again soon to help judge at the KoduKup final in May and whatever else I can fit in while there; perhaps some Project Spark and TouchDevelop. Overall it was a fantastic week and it was also great to catch up with friends like Ray and Simon, while getting to know Nicki & Dave Rogers better, but also it was lovely to make new friends with some amazing educators from all over the planet. I have a bunch of events lined up between now and the summer, all of which would not have happened without my involvement with the Partners in Learning network. I am going to Lincoln University next week to present on Kinect for Windows v2, as well as taking part in a Kinect Hackathon. During our Easter break in April, I am going to the Codebits conference in Lisbon, Portugal, to present on Kinect v2 and from there I fly to Berlin for a Kinect v2 developers event & Kinect Hackathon. At the end of April I will travel to Microsoft’s data centre in Dublin for a Microsoft MVP open day. In June I am doing workshops on TouchDevelop and Project Spark at Games Britannia which is being held at Sheffield Hallam University. The same week I am presenting on Kinect and playful learning at the JISC ITECH conference in Glasgow. So busy, busy times ahead. Thanks to Stuart Ball and the PIL UK team for all their support and the opportunities they have provided me. It’s been a while since I last updated my blog; I’ve just been so busy that I’ve hardly had a chance. Last time I wrote I was about to head down to Birmingham for the NEC Skills Show to demonstrate the incredible Project Spark, so I thought that would be a good place to start. I spent two days at the Skills Show at Birmingham NEC, at the invitation of Lee Stott (Microsoft Technical Evangelist), presenting on Microsoft’s amazing new game creation tool Project Spark and on Microsoft’s cross-platform app development tool TouchDevelop. Microsoft sponsored the City and Guilds stand at the Skills Show, which was an amazing event which had at least 75,000 visitors over the 3 days of the conference. I also got to meet up with another one of Microsoft’s Innovative Expert Educators, Simon Johnson Highfields School – Secondary Comprehensive (11-18) in the City of Wolverhampton.a High School Computing teacher from Highfields School in Wolverhampton. I had been corresponding on Twitter with Simon for months about TouchDevelop, as he was using some of my TouchDevelop game creation tutorials with his pupils. Simon has set up a TouchDevelop challenge website with some great resources on it and fascinating examples of games created by his pupils. Simon concentrated on TouchDevelop at the Skills Show, while Simon Michael (Microsoft Technical Evangelist) and I concentrated on spreading the word about Project Spark to the legions of High School pupils passing by. The reception for Project Spark was incredible; I really think the creative types who love Minecraft will love it. Project Spark has the creative aspects of games like Minecraft and game engines like UDK, but unlike Minecraft you can change the way the world works and program the characters to do what you want, including programming NPC (non-playable characters) with AI. Spark was created by the same minds behind Kodu and it builds on the simplistic language of KODU, so those who are familiar with coding in Kodu will take right to it, however there is so much more you can do in Spark than you could in Kodu. In Project Spark you can create a rich beautiful 3D world with its amazing next generation graphics, far superior in my opinion to the blocky world of Minecraft, but for those who love their Minecraft blocks there is even a cubify option. Project Spark has been added to the Kodu Kup competition this year and it will be launching free soon on Windows8.1, Xbox One and Xbox 360. 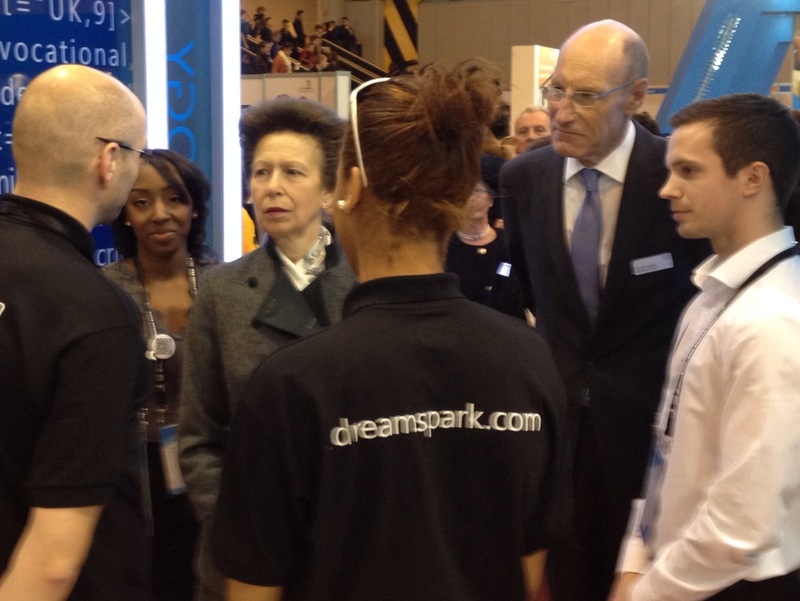 I had a great 2 days at the show, showing off Project Spark to the multitudes and even saw a few famous faces, like Theo Paphitis of Dragons Den fame and Princess Anne, who came by our stand for a visit, but unfortunately did not try her hand at Project Spark. I also got to demonstrate and do a recording of my Kinect Math Mage game, being played by Dolly bow bow. What you have never heard of her? Neither had I, she is YouTube famous evidently :-). Straight after my 2 day stint at the Skills Show, I jumped on a plane to Seattle from London for my first visit to Microsoft HQ in Bellevue, which is just outside of Seattle on the North West coast of the USA. I was visiting for the Global MVP summit, as I have recently been awarded the title of Microsoft Most Valuable Professional for Kinect, making me the only Kinect MVP in the UK. The MVP programme has around 4000 professionals in it from over 90 countries and they answer more than 10 million questions a year to the technical community. 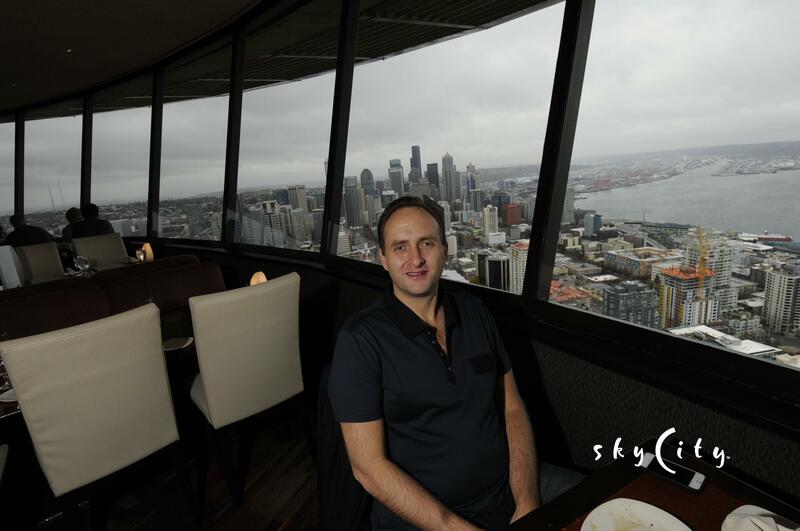 I got to Seattle on Saturday and the conference was beginning Sunday evening, so I spent Sunday during the day doing a bit of sightseeing, my favourite thing was having brunch at the top of the Space Needle. Full HD colour camera feed. Much wider field of view (removing the need for the tilt motor). 6 skeletons can be tracked at once instead of 2. Much more accurate skeletal tracking with more joints detected and far less jitter. 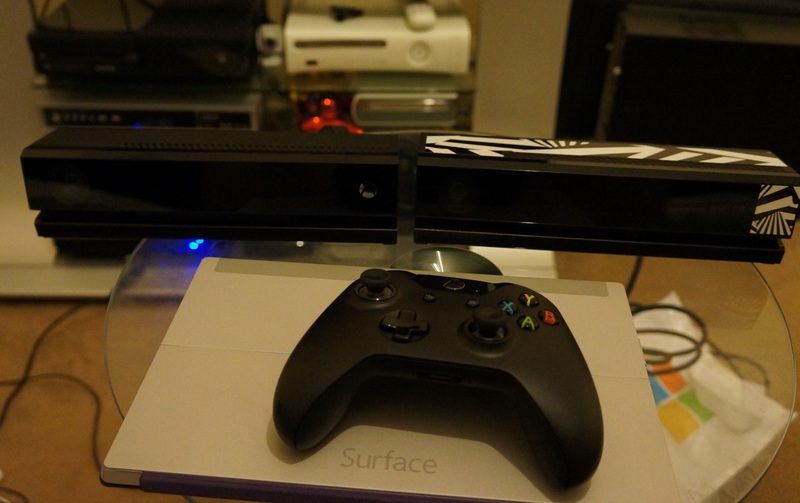 It can now track when someone is standing side on to Kinect. It can also detect if you are leaning forward or backwards and continue to track joints. Hand detection and tracking, allowing for better grip detection and new gestures such as lasso which is pointing two fingers together for drawing or dragging. 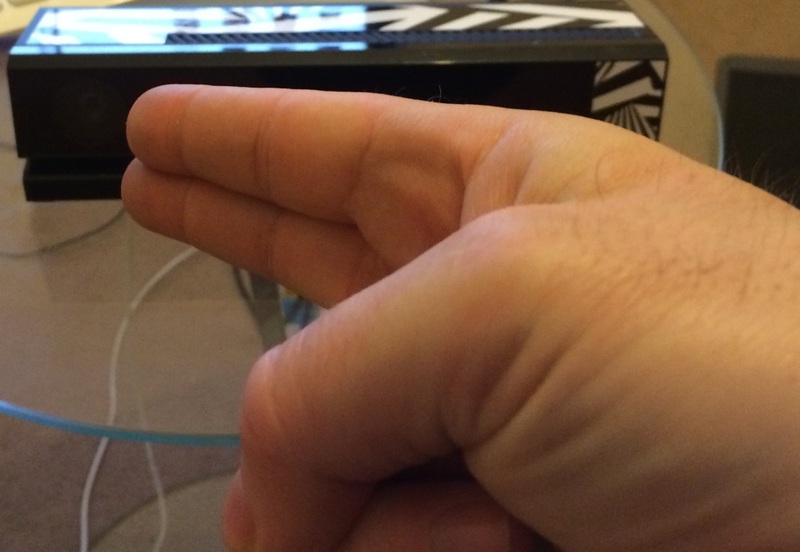 Also thumb tracking allowing the detection of a shooting gesture, which I’m sure, will have applications in games. Facial expressions are now available such as left or right eye open or shut, smiling, mouth open or closed and more. It should even be able to tell if you are wearing glasses or not. Most of the processing is now done on the GPU rather than the CPU of your computer. It now comes with and requires a USB3 port, which allows for a much higher throughput of data from the sensor. 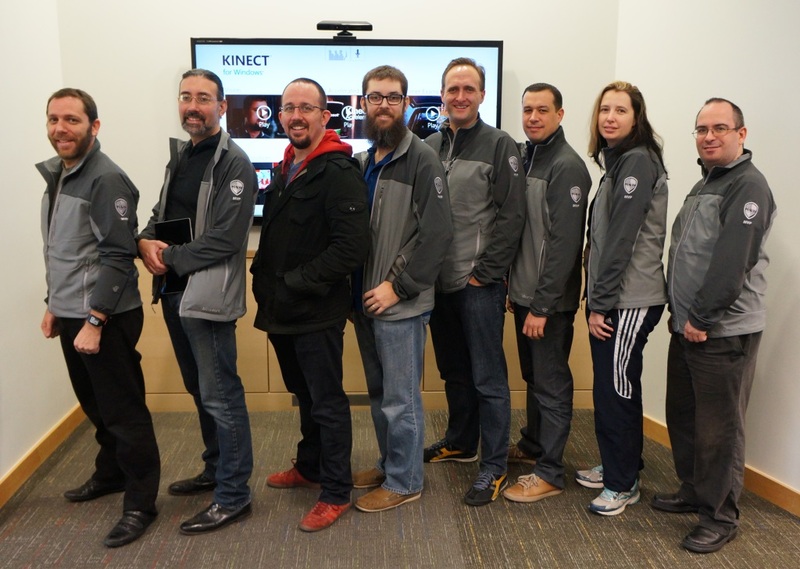 While I was at the conference all Kinect MVPs in attendance (about 12 of us) were gifted an alpha version of the new Kinect for Windows (K4W) v2 developers kit. It really is an amazing piece of kit and the accuracy of skeletal tracking is far superior to the previous generation. All MVPs attending the summit also received $300 off a Surface 2, making it a bargain at only $150, plus they gave us a free keyboard cover as well. I really love my Surface 2 and my iPad mini has almost been retired. There are still some Apps missing that I would love on Surface, but when I want to do some serious work on the go, or I want to take my work with me without having to carry about my full size laptop, there is no comparison and Surface wins. Plus it has a USB3 port, which might seem like a minor thing, but it really is a God send on a tablet when you have been used to not having one on the iPad. On the afternoon of day 2 of the conference I was able to visit with the TouchDevelop team in their offices and meet Peli and Nikolai who I have been emailing for the past year. I have spoken with Peli on the phone and in person many times while I was creating my games development curriculum for TouchDevelop, which I have been using to teach games programming to our entry level college students. It was great to see where TouchDevelop was created and meet with the rest of the TouchDevelop team. On the morning of day 3 I got a message from Peli early in the morning, asking if I wanted to go to a School with him, so I quickly got ready and took a taxi out to the school for 8.30am. Peli goes to the School 3 or 4 times a week from 8am until around 9.30am and then goes into Microsoft to do a full day’s work, that’s commitment for you. I gave a talk to the class about games development and TouchDevelop and showed them some techniques I use with TD to make games with my students back in Scotland. 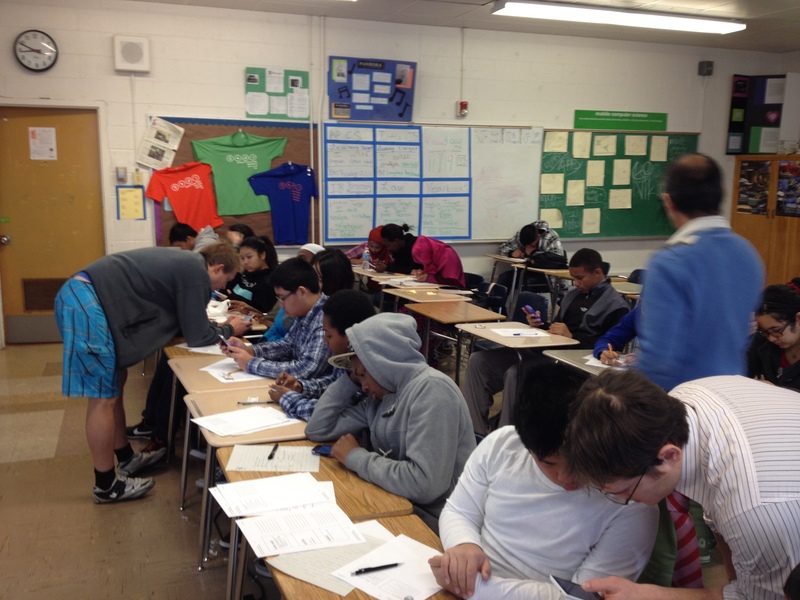 It was fascinating to see a full class working on TouchDevelop just using phones or tablets to program on. In college we mainly run it on a pc and load it up on a phone or tablet for testing, but these students were doing it all on the phone. It was also strange and flattering to hear that students from half-way around the world were making games using my games curriculum. Later that day I recorded a video for Microsoft where I was interviewed about my use of Kinect and they also recorded me demonstrating my Kinect Games. 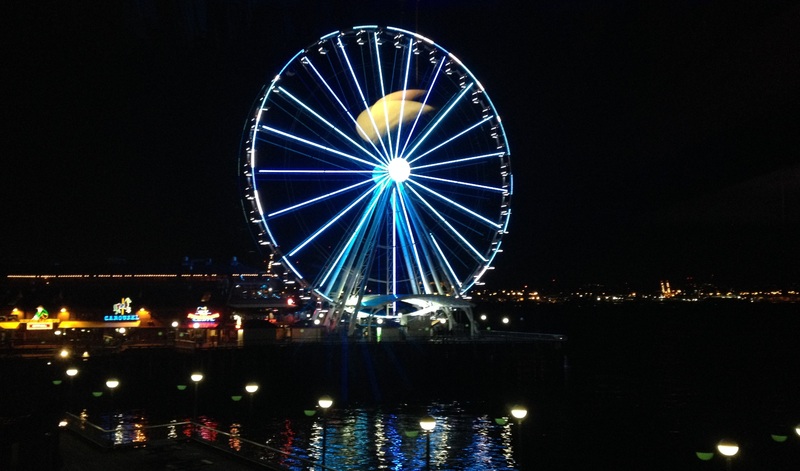 That evening I had a great night out at the MVP attendee party at the Seattle Aquarium and Seattle Great Wheel, at which I beat Ben Lower at Kinect Golf and enjoyed a ride on the Seattle Great Wheel, which is a slightly smaller version of the London Eye. On the last day of the summit I visited Microsoft’s amazing Envisioning Center with the rest of the Kinect MVPs and I got a glimpse into the future of technology, which evidently involves a lot of talking to appliances and rooms which sense your presence and sets the environment to suit you. 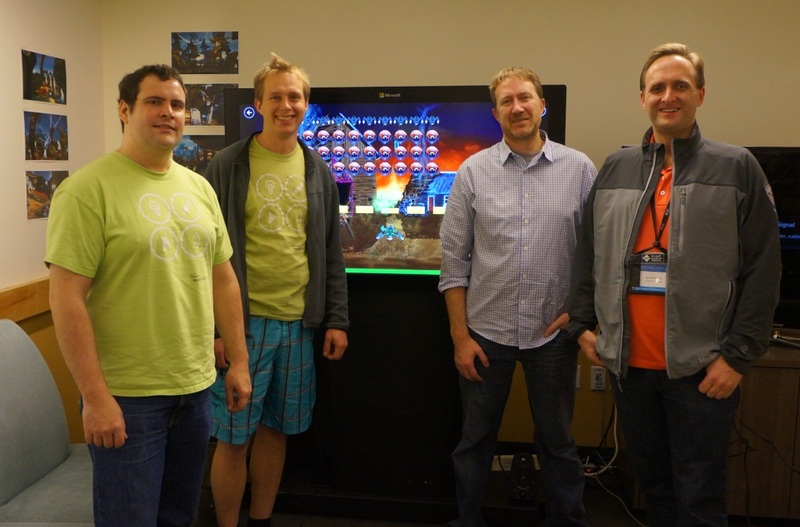 I also got to go to the games studio that is behind Project Spark and meet with Scott Fintel who is project lead on both Kodu and Project Spark. I got to see the team hard at work on Spark and see the amazing concept art behind Spark. Peli & Nikolai from the TouchDevelop team came over later on and we jointly recorded a video with Scott, about Kodu and Project Spark for the Hour of Code on Channel9. The MVP summit was truly an amazing experience and I got to meet some incredible people from Microsoft as well as some inspirational MVPs who are doing amazing things with Kinect and other technologies. I just hope they renew my MVP award next year so I can attend again. 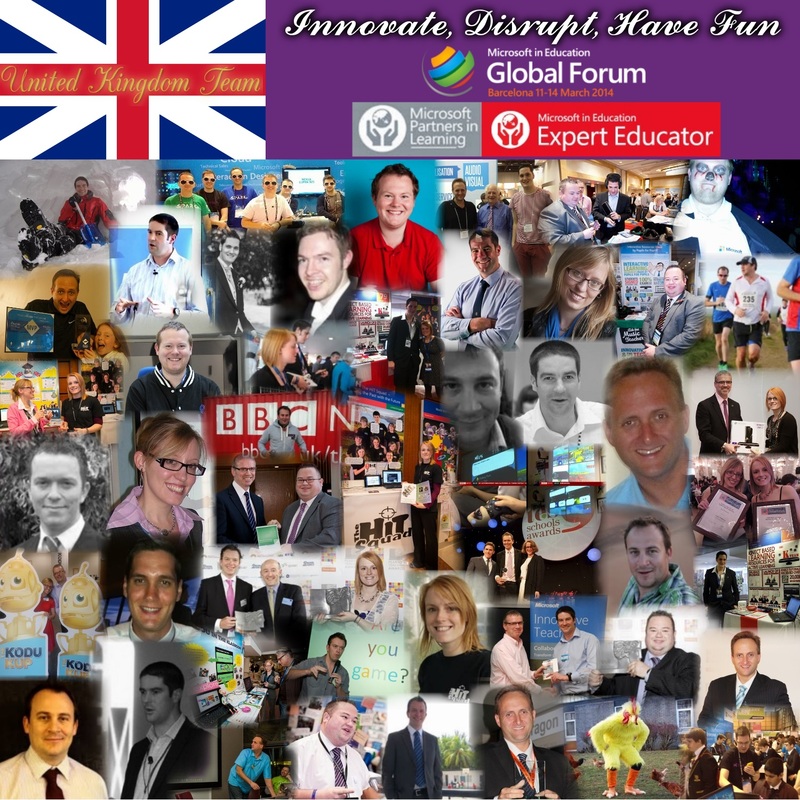 The last (but not least) part of this blog post is about my visit to Cardiff in Wales to meet up with the other Innovative Expert Educators who will be attending the Global educational forum in Barcelona with me. Strangely enough Wales is the only country in my travels with Microsoft to which I had never been before. It was great to meet up with friends like Gareth, Ray, Stuart & Simon, but also to meet the likes of Katie, David Rogers & Scott for the first time. Gareth Ritter became our tour guide for the weekend and took us in his School mini bus around Cardiff finding various places to eat and drink that only Gareth would know about. When we got down to work on the Saturday, Stuart Ball laid out his plans for us for the coming year as MS Innovative Expert Educators and discussed our areas of expertise and what we are going to focus on. He also helped us get our heads around what we need to do for Barcelona in March. Overall it was a great weekend with some old friends and some new ones and Wales is not that bad after all, but Cardiff Airport is tiny, what gives with that? Thanks again to the Partners in Learning Network and in particular the UK programme manager for PIL Stuart Ball, for supporting us Innovative educators and for putting me on this path. Also a shout out to Lee Stott Technical Evangelistic at MS for inviting me to speak at so many events and for the great support he has given the Games Dev courses at West College Scotland over the past few years. 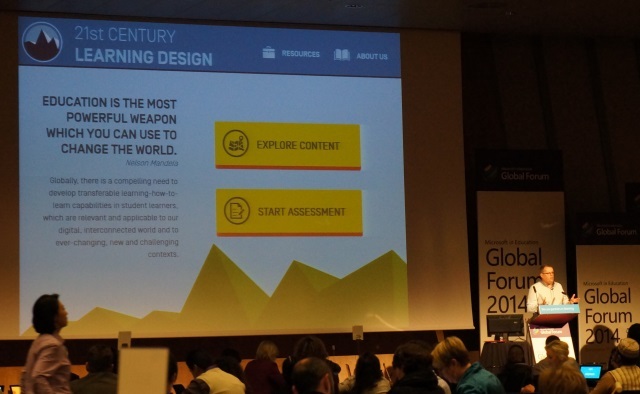 My next post about my travels with Microsoft will be on the Global Education forum in Barcelona in March, at which 250 of the most innovative and inspiring educators from around the globe will be in attendance. Watch this space! The main reason for this blog entry is to have a single place for teachers to grab the best of my resources. 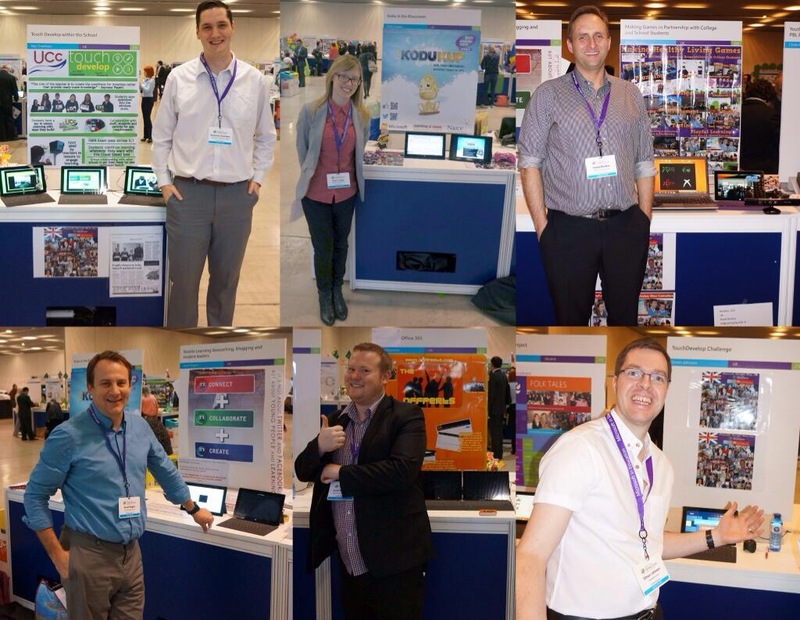 I’m doing a stand at the Scottish Learning Festival next week, where I will be promoting the CPD training my college (West College Scotland) can provide in coding using tools like Kodu, TouchDevelop and Scratch. However I will also be demonstrating my educational games as well and I will be directing teachers to this blog if they are interested, so again a single place to get everything will be beneficial. My games were just shortlisted for the SQA Star Awards in the category of Innovation and I will find out in November if they win first place. Click here to download xGames v2.2 installer which will run on Windows XP, Windows 7 and Windows 8 (135MB). You require 2 to 4 wireless XBOX360 controllers which you connect to your PC with a USB wireless receiver. If you are using the Kinect for Windows sensor with your Windows7/8 PC then click here to download the Kinect for Windows runtime v1.7 (110mb) and then install it. If you are using the XBOX 360 Kinect sensor with your Windows7/8 PC for evaluation purposes then click here to download the full Kinect SDK v1.7 (222mb) and then install it. Finally click here to download Kinect Games v4.1 installer (160MB) and install it. Alternatively click here to download Kinect Games v4.1 all in one installer (383MB) which includes the SDK and install it. If you have any problems either of the installers then click here to download the XNA4 runtime installer (6.72MB) and try installing it first before running the installers. Click here to download my games development curriculum for teaching coding using Microsoft’s free HTML5 browser based free development platform TouchDevelop. 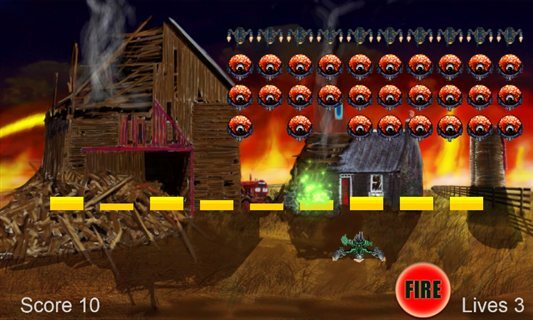 Click here to visit my YouTube channel for my free tutorials on creating games using TouchDevelop. These videos tie in directly with my games dev curriculum. Keep on eye on this channel as I plan to add a PacMan tutorial soon. Click here to download the free official TouchDevelop book from Microsoft. Click here to visit the TouchDevelop challenge blog, which contains more tutorials for teaching coding as well as a forum for students to share their games and blog about their experiences. Click here to visit Ray Chambers blog and have a look at his scheme of work for teaching coding using TouchDevelop. 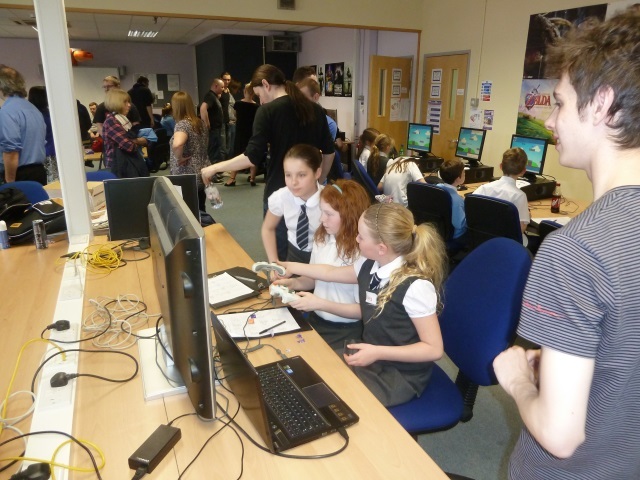 This year our HNC Games students at Reid Kerr College worked in partnership with a local Primary School, Lochfield Primary in Paisley, to produce games for their HNC Group graded unit project. This is the third year we have worked in partnership with Lochfield for our HNC Graded Unit games, however this year we took things a step further with the schoolchildren actually contributing art work for the games. The project began in February and in discussion with the school we set the theme for this years games to be “Healthy Living”. So we tasked our students to come up with game ideas that promote an awareness of the benefits of healthy living and asked them to select a representative from each team of 4, who would present those ideas to the primary school. On the 8th of February we visited Lochfield Primary and our students gave PowerPoint presentations on their game ideas to around 70 Primary 6 pupils. They were then given the opportunity to get feedback from the kids and discuss their ideas further in small groups, effectively using the schoolchildren as a focus group. Some of my students were extremely nervous about the idea of presenting to and talking to schoolchildren, but as in previous years those fears soon dissipated when they realised how enthusiastic and positive the children were about the games, something that rubbed off on the rest of their team-mates when the representatives reported back. One thing that we introduced this year, which we hadn’t done before, was that we asked the schoolchildren to draw art for the games, so during the discussions with the schoolchildren, our students also discussed with them the types of art they would like them to create. 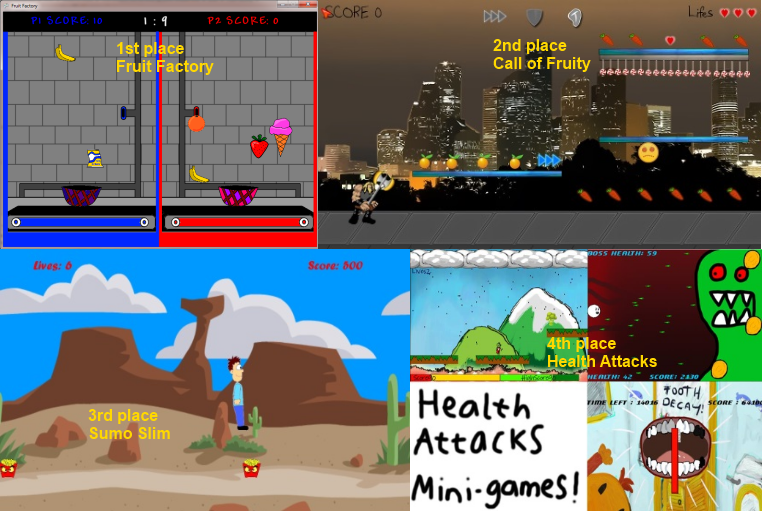 From February to May our students worked away in their teams turning their concepts into games for Windows 7 using XNA4. We received a bunch of art from the schoolchildren which we scanned in and used in at least half the games, along with art produced by our own students. 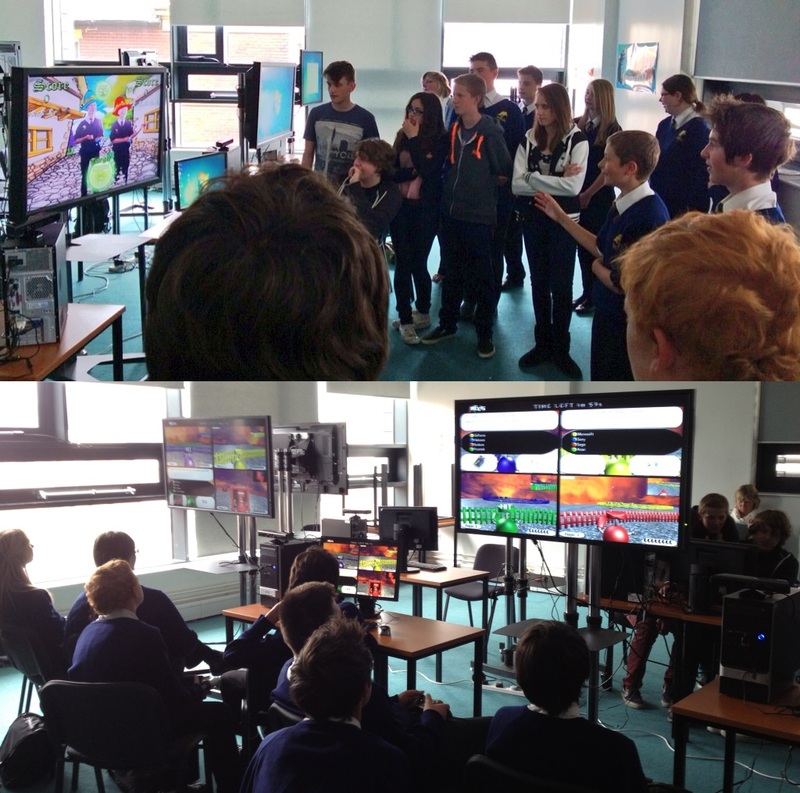 On May 20th we had a big event at the college and over 70 Primary 6 pupils were bussed into the college for the day. We had to split the schoolchildren up and we enlisted help from the Care & Construction departments in our college, who took turns with half of the group while the other half played the games our groups had created. Once the children were finished playing the games they went onto an online survey and rated the games out of 20, based on originality, graphics, sound and most importantly gameplay. Lee Stott from Microsoft attended the event and very kindly provided prizes, in the form of Kinects, for the winning team. It was a close call between two of the games and in the end one vote could have swung it either way; eventually the only game which featured a 2 player mode won. In the end it was a triumph for gameplay, however the game which came second had an excellent concept, was a great game with far more complexity to it and even had a level designer. I’m hopefully they will develop it further and enter it into the imagine cup next year. 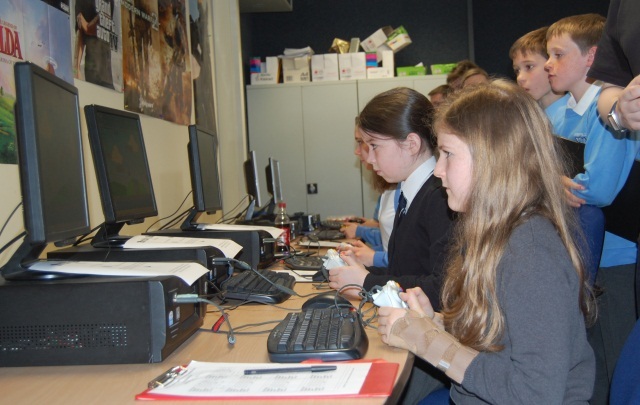 This partnership with Lochfield Primary has improved our students’ experience of learning in a number of ways and opened the eyes of the schoolchildren to games development as a possible career path. 1. They had a realistic learning experience by designing and writing games for a live client group. 2. The partnership was an enjoyable and positive learning experience for both the schoolchildren and the college students, as they experienced working with a partner to produce artwork for the games. 3. The competitive element of the partnership was appealing to them and a motivating factor. 4. Peer review by other students and by the schoolchildren was invaluable in forming ideas on how the games could be improved in the future. 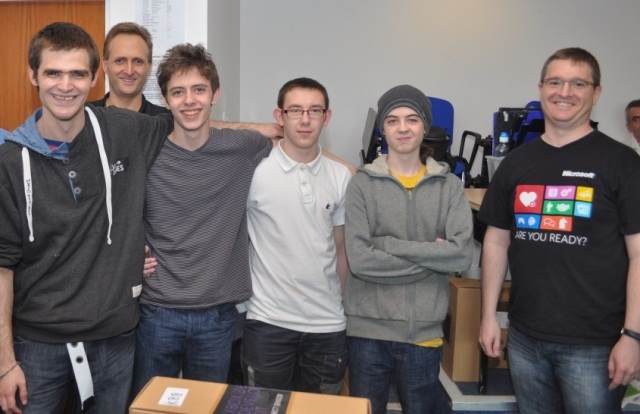 The winning team (from left to right: David Savage, Grant Hamilton, Michael Collins & Ryan Kennedy, along with Lee Stott from Microsoft). Lee stayed on after the schoolchildren had left and took part in a judging event in the afternoon with my HND Games Development students, who had been tasked with producing a Windows Phone game based around an apocalyptic theme (so lots of Zombie games). We had an impressive judging panel,which I had kept as a little surprise from my students :-), that included myself, David Marshall & Martin Barrett from Reid Kerr, Fiona Rushton & Ian Tyson from James Watt, Daniel Livingstone from UWS and of course Lee Stott from Microsoft. Ten of my students presented their game concepts, how their games had been developed and how they felt about the way their game had turned out. They also answered questions from the panel, who had the opportunity to play all the games on Windows Phones. 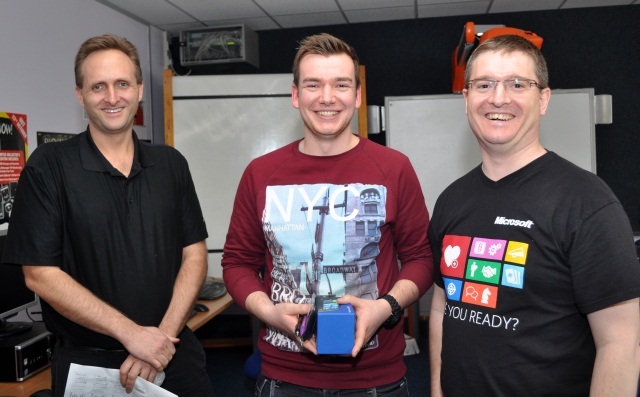 In the end the panel came up with a top 3 and Lee presented the winning student with a Windows Phone as a prize. 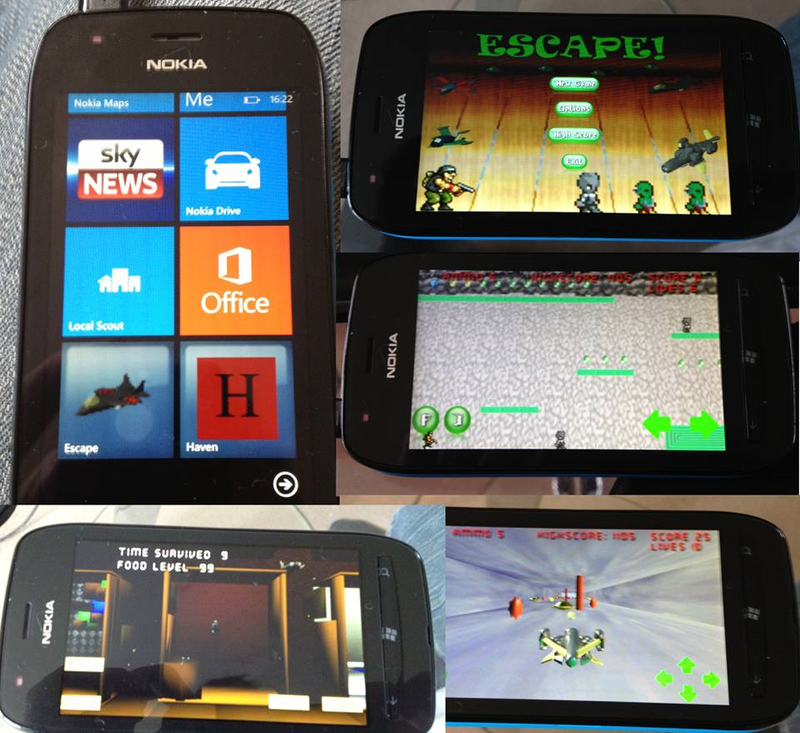 The 2nd and 3rd placed games – Escape and Haven (Escape is on the right hand side, Haven is at the bottom left). I have updated all my Kinect games to use the new Kinect SDK v1.7 and with it I have added some significant changes. 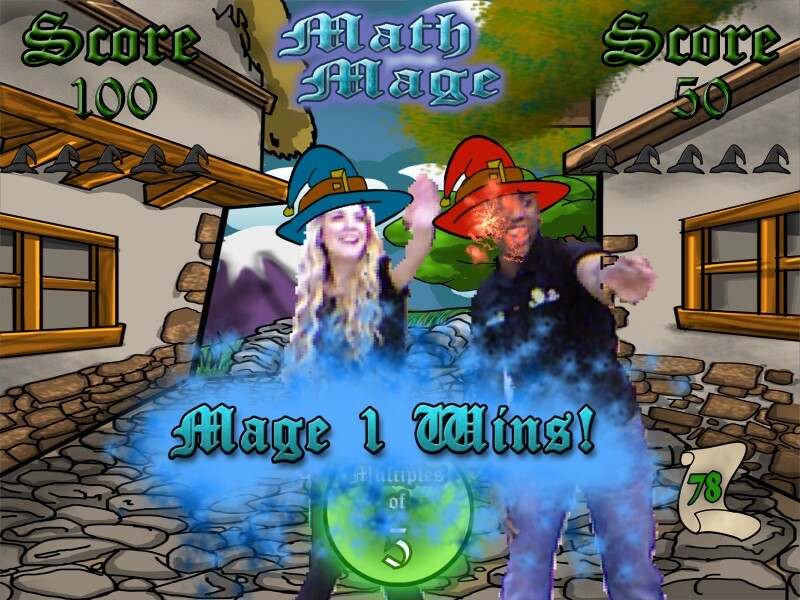 Math Mage & Word Mage now feature a fully immersive, interactive Augmented Reality experience, where the player actually appears in the game world wearing a Mage hat nonetheless :-). This works for both 1 player and 2 player modes. You can also now press number keys 1 or 2 to toggle player 1 or 2 between Right-Handed and Left-Handed modes. You can also take extra snapshots of the players in the game by pressing the SPACEBAR on the keyboard. In Math Mage you swipe through the correct numbers using your right hand or left hand in the style of “Fruit Ninja” and you must avoid swiping the wrong numbers. It can be used to revise times tables, odd numbers, even numbers and prime numbers. Word Mage uses the same principal, but with Nouns, Adjectives, Verbs and Adverbs, where you must swipe through the target words and ignore the words outwith the target category. You can edit the word lists and there is even a miscellaneous category where you can make up your own word lists based on anything like countries, capitals, foods etc. 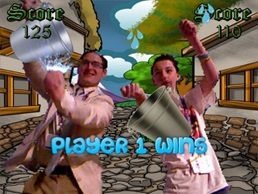 Kinect Games version 4 also features my new NoNeed4Green, the Green screen without a green screen, which you can read more about in my recent posts, but it bascially lets you create scenes using background pictures and foreground objects of your own choosing, while people who stand in front of Kinect are cut out and placed in the layer between the background and foreground to produce images which can be saved. Watch the video below recorded using FRAPS and you will get the idea. My magic cursor, which lets you control Windows using your hands, now works with press and grip gestures for doing the left mouse button. To simulate a left-click you simply PRESS with your left hand. If you GRIP (make a fist) with your right-hand it simulates holding the left button down. If you RELEASE (stop making a fist) it releases the left mouse button. To move the mouse cursor you simply move your right-hand in front of Kinect. Kinect Angles, Kinect Time and Kinect Pong remain pretty much as they were, but are updated to use Kinect SDK v1.7. Read my earlier blog posts for details of those games. Click here to download the full stand-alone installer for the latest version of Kinect Games which includes Kinect SDK v1.7. Click here to download the latest installer for Kinect Games without Kinect SDK v1.7 (for those of you already have the SDK this download is significantly smaller). The games require a Kinect for Windows or Kinect for XBOX360 device connected to a Windows 7 or 8 pc. Please download the games and use them with your students. I’d love feedback from teachers who are using the games on their experiences with playing the games in their classrooms. Please email me at david.renton@wcs.ac.uk with comments and feedback. 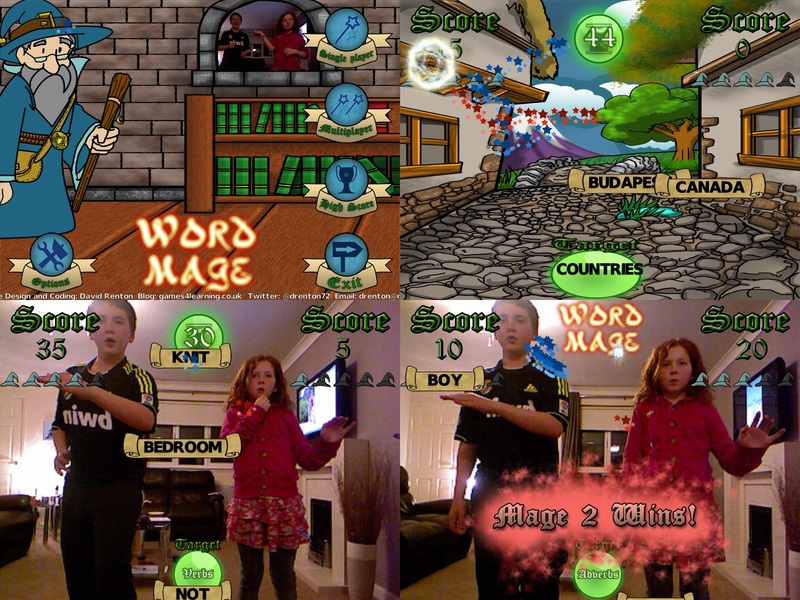 During my adventures with Microsoft in London a week ago, I created a Windows 8 app version of my Math Mage game using Microsoft’s new TouchDevelop platform and later on that week I created a new version of the game called Word Mage, which tests students’ knowledge of Verbs, Nouns, Adverbs and Adjectives. 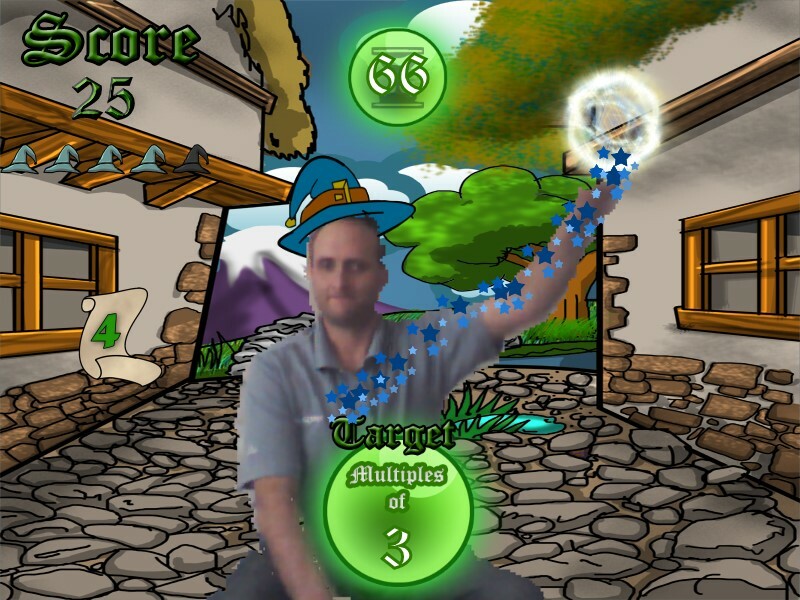 The new game was for a Hackathon competition and was hastily put together, but I thought the idea was a good one, so I’ve now created Word Mage for Kinect for Windows, based on my previous Math Mage for Kinect. As a programmer turned teacher Maths makes perfect sense to me, English on the other hand not so much, so this game is one that I could have done with growing up, if not present day :-). The new game is just like Math Mage in that it employees “Fruit Ninja” style gameplay in an educational game which consolidates learning in multi-sensory active way. Educational theorists say that multi-sensory active methodology is the best form of pedagogy :-). With that in mind I bring you Kinect Games, which adds the all new Word Mage along with Math Mage, Kinect Angles, Kinect Time, Kinect Magic Cursor and Kinect Pong. Kinect Games v3 will run on Windows 7 or Windows 8 desktop mode and will work with an XBOX360 Kinect or the official Windows version of Kinect. Click here to download the latest version of Kinect Games including Kinect SDK. Click here to download the latest version of Kinect Games without Kinect SDK (for those who already have it installed). Click here to download the source code for my Kinect Games. 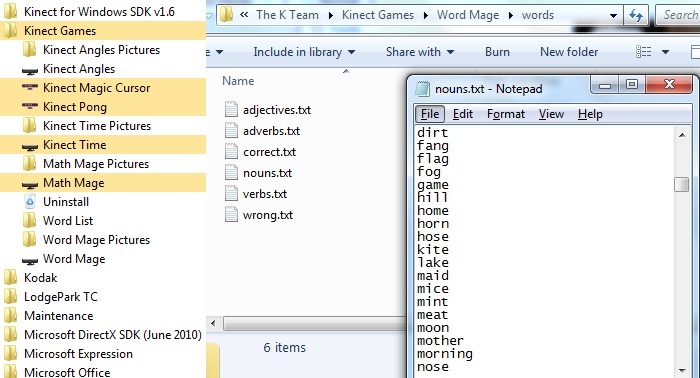 The Kinect for Windows version of Word Mage adds a brand new feature which allows you can add your own words to the game by editing the word lists. It also includes two extra word lists for the special mode in the game, which will then use whatever words you put into the “correct.txt” file for correct answers and whatever words you put into the “words.txt” file as wrong answers. For an example the files that come with the installer have a list of countries in the correct.txt file and a list of cities in the wrong.txt file, so if you select the special mode, players will be trying to identify countries instead of cities. You can use this for mode for whatever you want, be creative with it please :). You can also edit the list of nouns, verbs, adjectives and adverbs as you see fit. The 3 difficulty levels in the game increase the speed at which the words come at you, but they also increase the range of words used. In easy mode it only uses the first one third of the word list, in medium it uses the half of the list and in hard mode it chooses words from the entire list. I tried to remove words from the lists that could be both verbs and nouns etc, but if I have left any in please send me a message and remove them from your own list. It’d be great to get an English teacher on the job of perfecting the lists, any volunteers? In game it defaults to video mode off, if you want to allow the players to see themselves while playing press the S button during the game to turn the video feed on. If you want to turn it back off press the SPACE BAR. Some computers may lag with the video mode turned on, so try it out and see. On the main menu you can adjust the angle of the Kinect sensor by using the UP and DOWN arrow keys on the keyboard. 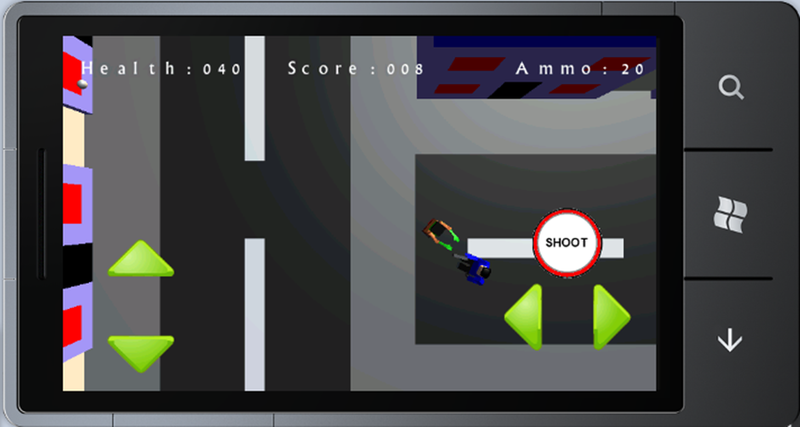 Adjust it so that the players’ heads are clearly visible in the small window in the top middle of the main menu screen. Please download the games and use them with your students. I’d love feedback from teachers using the games around the world on their experiences with using the games in their classrooms. Please email me at david.renton@wcs.ac.uk with comments and feedback.